Why send samples to a WHO Collaborating Centre (WHO CC)? A key responsibility of WHO National Influenza Centres (NICs) is to submit influenza viruses in a timely manner to one of the WHO Collaborating Centres for Reference and Research on Influenza (WHO CC) in Atlanta, Beijing, London, Melbourne or Tokyo. Other diagnostic and reference laboratories are also encouraged to submit influenza virus isolates and specimens to a WHO CC to extend the geographic range of WHO’s influenza surveillance. The results of virus analysis at the WHO CC will be reported to the submitting laboratory and compiled with results obtained for other recent viruses so that WHO can monitor the evolution of influenza virus strains throughout the year and make recommendations on suitable strains for use in vaccines. The following information is for laboratories submitting samples to the WHO CC at VIDRL in Melbourne. When and what kinds of samples should be sent to the Melbourne WHO CC? • Collect appropriate clinical specimens from patients throughout the year and especially during the influenza season and outbreaks. • Forward a range of representative viruses collected over time and from around the geographic region to a WHO CC. In what form should samples be sent to the Melbourne WHO CC? We accept both viral isolates and original clinical specimens. If you are able to perform viral culture in your laboratory, viral isolates are preferred. However, if this is not possible, clinical specimens are very welcome. The best clinical samples are nasopharyngeal aspirates or nasopharyngeal swabs. Nasal washes, nasal swabs, throat washes and throat swabs are also acceptable. If you are sending viral isolates, please make sure that the original clinical specimens can also be made available to us, either through storage in your laboratory for later access or, if possible, by sending a clinical specimen along with your viral isolates. How are samples used at the Melbourne WHO CC? We will first confirm the subtype of your influenza samples. Provided we can culture the viruses, we will then determine their antigenic properties using haemagglutination inhibition assays. In some cases, we will also test their susceptibility to antiviral drugs and sequence their HA and NA genes. This information is combined with data from influenza samples from all over the world to inform WHO about the characteristics of circulating influenza strains and to determine which viruses should be included in seasonal influenza vaccines for the coming year. To read more about influenza surveillance activities at the WHO CC, click here. We will also isolate viruses of special interest (eg, new antigenic variants) directly from original clinical specimens into eggs to obtain candidate vaccine viruses. If one of your samples looks interesting and you have not already sent us the original clinical specimen, we will contact you to ask you to send us the specimen. When does the Melbourne WHO CC want to receive samples? Where possible, please send us representative samples at regular intervals during the influenza season, for example every two to three weeks during the peak of the season, and every one to two months outside the peak. Please avoid sending samples in large batches collected over long periods as up-to-date data for the current season are the most useful. Not every sample is required; representative samples that reflect the relative proportions of each circulating subtype are preferable. So that we can process samples and obtain the most recent data in time for the WHO Consultations on the Composition of Influenza Vaccines in February and September each year, please ensure that current samples reach us 4 weeks ahead of the Consultation, ie. by mid-January and mid-August. What happens after you have sent your samples to the Melbourne WHO CC? We will process and analyse your samples as soon as possible. As the viruses need to be grown in culture first, this usually takes about 2-3 weeks, but in busy periods it may take longer. Please indicate to us if and why any of your samples require urgent attention. 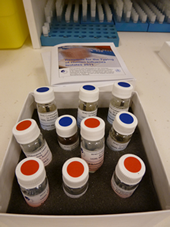 When we have analysed your samples, we will send you about a report on their subtype and strain. If they were tested for antiviral drug susceptibility, we will send you a separate report on these results. If we find anything unusual, we will contact you to discuss the results. What happens to sequencing data obtained from your samples? The GISAID EpiFLuTM Database is the most complete collection of influenza sequences with their associated metadata and is used by the five WHO Collaborating Centres for Reference and Research on Influenza to make available sequence data and any other information associated with a submitted virus. Other information includes the country, province and town of origin of the specimen, the collection date and the name and address of the NIC which contributed the specimen to the Collaborating Centre. Any other epidemiological and clinical information provided may also be added, including the original sample identifier given by the NIC (unless it is a patient’s name). The original NIC identifier allows the NIC to track the sample in its own system. Data are uploaded to the EpiFLuTM Database regularly. Any available extra data are always uploaded before the WHO vaccine selection meetings in order to provide the latest information to support the selection of vaccine candidates.